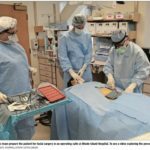 Front Page Coverage in The Providence Journal - Defying Gravity - Patrick Sullivan, M.D. Are you interested in regenerative medicine? The most recent advances? 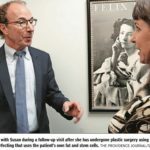 I had the pleasure of taking G. Wayne Miller – a very talented writer for The Providence Journal – behind-the-scenes of a facial rejuvenation using advanced stem cell techniques with one of our patients who made the trip from the west coast to our office in Providence for her procedure. The article in The Providence Journal (Sunday, December 11, 2016) is titled, Defying Gravity: R.I. doctor at vanguard of cosmetic surgery. Wayne Miller did a superb job in educating people about how fat injections with their associated stem cells have improved the lives of so many adults and children.